Hi! My name is Jake Sams and I’m a 23-year-old agriculture student from Holland. I recently finished my study of Biodynamic agriculture. 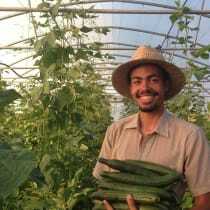 Growing vegetables, fruits, herbs and just farming in general is my greatest passion. I have always been fascinated by Asian culture, especially rural Asia. Now that I've been graduated, I plan to travel to Japan this August for a period of 3 months, working on different farms. After that I'll be working at a buddhist farming school in Thailand. The rest of my study trip will include countries like Nepal, Vietnam, Sri lanka, Indonesia, Cambodia, Malaysia and more. In most countries I will make use of organisations like "WWOOF", "Workaway" or "HelpX". These organisations facilitate homestays on organic farms throughout the world. Linking volunteers with organic farmers and growers to promote cultural and educational experiences based on trust and non-monetary exchange, thereby helping to build a sustainable, global community. My travel will last for up to 1 to 2 years in total. The purpose of this adventure is to learn and experience new and old ways of farming. I will do this by working at a wide variety of different farms throughout Asia. While learning their ways, I will share my knowledge and experience of modern western organic and biodynamic farming. 4 years ago, traveling to Japan for the first time and working on different farms inspired me to become a farmer one day. The beautiful countryside and the incredible community of people in small mountain villages made me want to come back. I have been studying Japanese for some years now. Not only because it's a beautiful language, but also as a way to learn from Japanese farmers and craftsman, meet new people and share knowledge. While traveling and working I will write blog posts about ecology, farming, culture, craftsmanship, nature and more. Mainly to share interesting, beautiful and realistic aspects of rural farm life cultures. Many thanks for your donation - whatever the size!